Re-designing your home’s interior can be a major challenge, especially if you’re not aesthetically inclined. For those who can afford it, a consultation with a high end interior designer can be the perfect answer. Generating an average of $8 billion in annual revenue, the United States’ 10,000 interior design companies can help property owners create safe, healthy, and attractive spaces. For those who can’t afford to work with luxury interior designers, however, there are other options. Here, we’ll look at tips for giving your home the high end interior design look without breaking the bank. Try to create a mood. High end interior designers usually start with a particular goal in mind, whether it’s to create a tranquil Asian style, sleek contemporary space, enlarge a small space, make a large space feel cozy, or evoke any type of feeling in the room’s inhabitants. Choose a focal point. In each room, have a piece or place in mind around which the rest of the room can revolve. That item or space should be the highlight of the room, and everything else should work to support it. Common focal points are fireplaces, armoires, artwork, a single painted or textured wall, or a window with a view. Pick colors carefully. Make sure your scheme is complementary and that the colors work well together. Neutrals should balance bright colors so that there aren’t too many different colors competing or too much dull neutrality. Use texture and pattern wisely. They draw the eyes to interesting details and bring balance to all the smooth surfaces typically fond in a room. Let in the light. There are a number of ways to use light to your advantage. High end interior designers recommend using mirrors to reflect sunlight or even a high quality lighting fixture. Mirrors have the added advantage of making smaller rooms appear more spacious. Lighter shades on the wall also contribute to play of light in the room. Hang art on the walls. Artwork adds a finished look to a room, but should be chosen carefully. Consider style and color, and be sure to hang any artwork at eye level. Grow something. Plants cool and refresh design themes, as long as they’re well cared for. Simplify. Get rid of as much clutter as you can, including excess furniture or too many accessories. Consider functionality. There is no point in a design element that makes it harder for you to move around and feel comfortable in your home. Pay attention to traffic flow, comfort, and maintenance. Go timeless, not trendy. 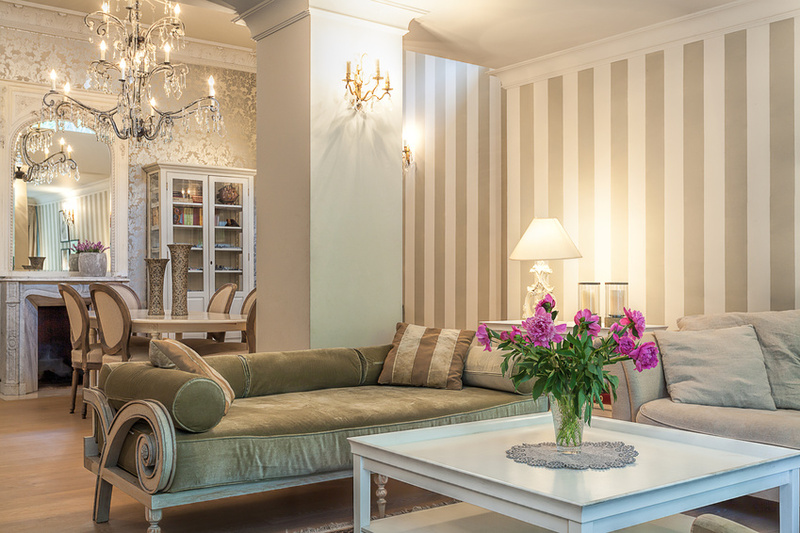 Luxury furniture stores often carry pieces that mimic older styles, and there is a reason for that. Investing in timeless, high-quality furniture means that you won’t want to re-design everything in a year. Choose pieces that will stand the test of time, and scour discount luxury furniture stores to get the best pieces for low prices.